Be creative and customize your own Premier Roulette table! Microgaming is a well-known software developer in the gambling world. Quite recently it has designed a new table game called Premier Roulette. It’s a version of European Roulette and uses only one zero instead of two, which is usual with American Roulette. One zero improves your winning chances. In just a short while Premier Roulette has gained a lot of popularity. 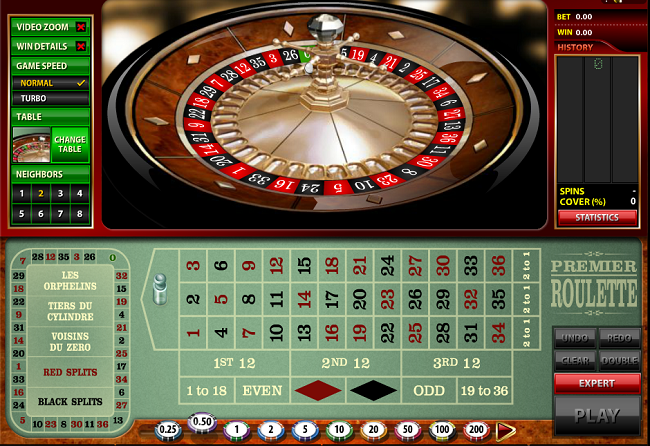 Players find it very exciting that they can customize the Roulette table, for example. How does this work exactly and what makes it so great? Perhaps you’re not an experienced player and you like to try this game first. You can do this by playing for free at websites like Onlineroulettewheel.co.uk. Perhaps you’re a standard player who just likes to win a nice amount of money. In that case you should always choose the regular mode of Premier Roulette. Professional Roulette players who like an extra challenge should click the ‘exert mode’. In the standard version you can only spin the wheel manually. The expert version is different though, because you can play Roulette with your own edited layouts. Customizing your own table is great fun. Usually you only find red and black in the wheel. However, during Premier Roulette you’re able to choose your own colour. Perhaps you have a lucky colour instead of a favorite number, which makes this option real fun. Suddenly the Roulette wheel can also be blue, green, purple or brown. This is not the only advantage though. The online game has an interesting layout with buttons that can you manage yourself. This makes it possible to navigate the screen and choose between several options. The Premier Roulette wheel with all its colors looks fantastic. It definitely shows that casino games look better every year. This Roulette version is even available in 3D, and you can clearly see this in the lay out of the table and the wheel. You can see them next to each other on your screen. The table and wheel layout both have their own functions. You need to use the table layout to stake your money on the inner and outer wager options. The wheel layout is meant to wager on the call and split. Perhaps you like to change the layout of the table. At the left side of the screen you’ll find the button to do this. Just click on it to activate and create your own table! A great thing about Premier Roulette is that its special design gives you all the information you need, for example the total amount of money that you’ve bet. The money that has been won and the ratio of the pay-out is shown on your screen as well. You can find an incredible amount of information on just one page. Do you have a question about it? Then contact the customer service, which is available 24/7 at most online casino. Sometimes it can be annoying that all the information about your pay-outs, prize money and more continually appears on the screen. Don’t be annoyed, because you can disable it manually. During Premier Roulette it’s also possible to zoom in and out to see if you have the winning number. Perhaps you’ve asked yourself in the past: ‘Why can’t the Roulette wheel go faster, if want to results right now!’. Well, with this new game it’s all possible. It has the so-called ‘turbo option’, which means that you don’t even have to see the spinning of the wheel. Instead the winning number appears immediately. It can be exciting to see the spinning of the wheel though. It definitely adds some excitement to Roulette. To enjoy this, just choose the ‘normal speed’ version. Despite all the colors and features, the basic rule of this Roulette game is the same: you need to guess the correct number. The ball has to end up on the right box to win the game. The betting options are the same as well. A popular one is ‘straight up’, for example. It means that you place a bet on one number, with a payment of 35 to 1. A wager on two numbers (Split) or three numbers (Street) is possible as well. Other options are Corner (four numbers) and six, which obviously means that you place a bet on six numbers. Hopefully the little ball will end up at your number(s)! Every Roulette game uses a minimum and maximum bet, and this version is no exception. Think about how much you like to put on the table and remember: never spend more money than you can afford to lose. The minimum bet at Premier Roulette is 0,23 dollar cents and the maximum bet 10.000 dollars. Start playing by clicking on the spin button. Perhaps you like a little challenge. At the left part of the table you can find a so called ‘racetrack’. It in that case you can put some money on the neighboring segments of the Roulette wheel. It means that you bet on several numbers surrounding the zero area of the wheel. We wish you a lot of fun!